helped the chicken change to become more successful. "crossed" the black man in order to trample him and keep him down. The point is that the chicken crossed the road. Who cares why? The end of crossing the road justifies whatever motive there was. 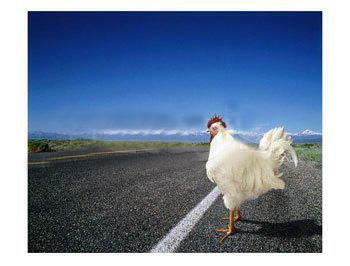 The question is not, "Why did the chicken cross the road?" we overlooked in our haste to observe the chicken crossing?" It was an instinctive maneuver. The chicken obviously didn't see the road until he had already started to cross.